Below you can find driving directions from Google Maps to help you get from North Miami Beach to your nearest Fix Apple Now store, situated in Hallandale. You can either copy the driving instructions below or click here for a larger map and driving directions. 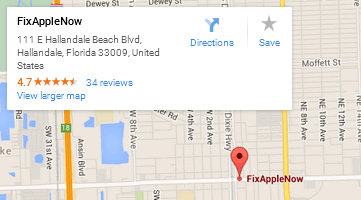 Are you looking for an Apple repair company that you can trust in North Miami Beach? Then take a look at Apple Fix Now. At Apple Fix Now, we can help if you're facing problems with a cracked screen, water damage, a frozen screen or your device not powering on or off, to give just a few examples. Whether you need to repair, replace, fix, replace, mend or restore your iPhone, iPod, MacBook or iPad, we can help, and what's more is that we offer some of the most competitive prices on the market. Our engineers have vast experience to draw upon and can resolve all sorts of problems with Apple devices. You can get in touch with us at any point if you have any queries about the services that we offer, so why not do so today? We can return your device to its former glory in no time at all so talk to us today if you need to fix your Apple device in North Miami Beach.